On September 12th the Planetarium in Hamburg will present the Premiere of a 360° audio-visual PLANET JARRE show which I am very excited to see myself. Tickets can only be won, so stay tuned. "The Planetarium Hamburg presents the new exhibition PLANET JARRE in 360° image and sound. 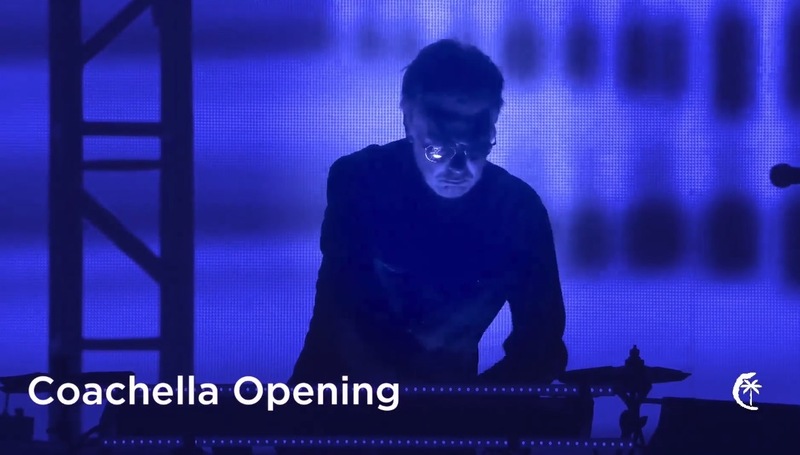 50 years of Electronic Space Music - as an audiovisual experience with Stars, Light and Laser. A journey to his greatest musical creations and ultimate playlists - his Soundscapes, Themes, Sequences and Explorations. 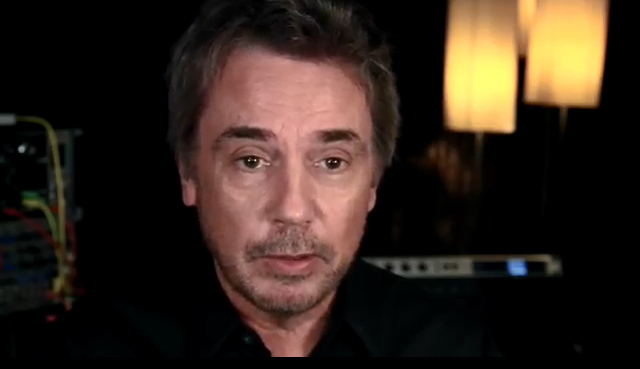 All Tracks were curated, remastered and retouched by Jean-Michel Jarre himself. Duration approx. 50 minutes, Tickets 13 EUR." To make sure you are always the first to listen to any new music I release, follow me and my Essential Hits playlist on Spotify or Apple Music. Also you get the chance to win tickets for the exclusive PLANET JAREE planetarium show on September 12th in Hamburg. Just follow the link below. Good luck! Follow me and my Essential Hits playlist on Spotify and Apple Music using the link in my bio. 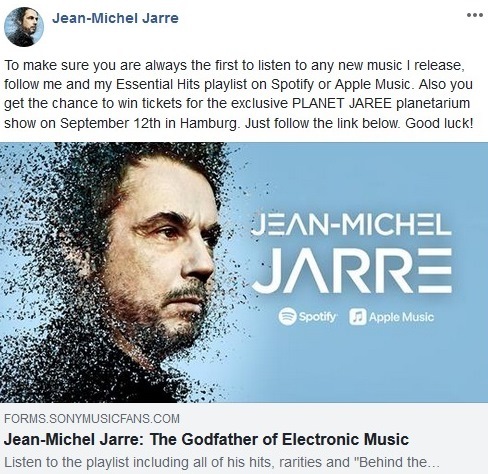 Doing so you never miss new music and get the chance to win tickets for the exclusive PLANET JARRE planetarium show on September 12th in Hamburg. Good luck! New episode of my #50yearsofmusic series on YouTube. This one is about 1976 - the year of the release of my album Oxygene. 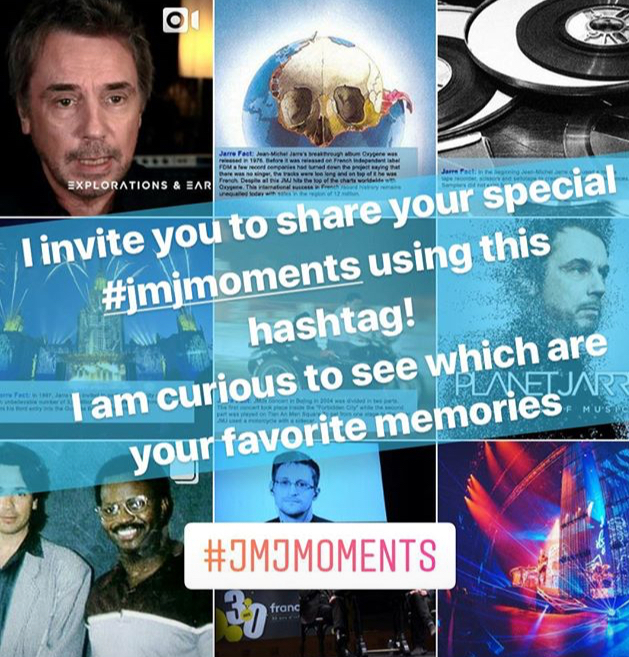 If you use Instagram, please share your special moments with the hashtag #JMJmoments there. On September 14th 2018 Jean-Michel Jarre releases his ultimate Best Of PLANET JARRE - 50 YEARS OF MUSIC. Very happy to finally release COACHELLA OPENING. A track I composed for the festival show this spring. 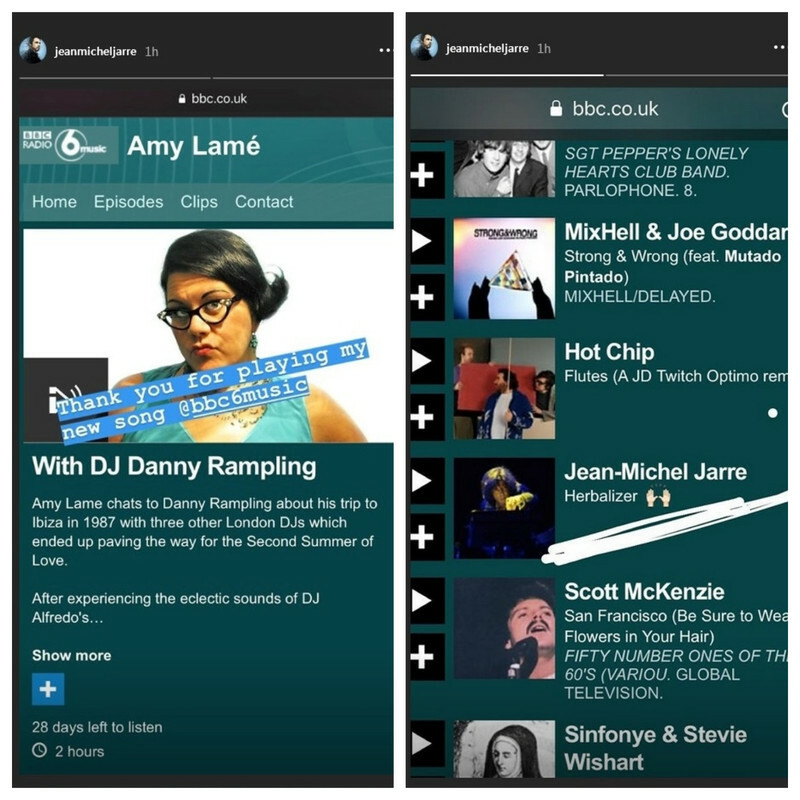 It’s based on the repetitive and hypnotic sequences that only electronic instruments can create. 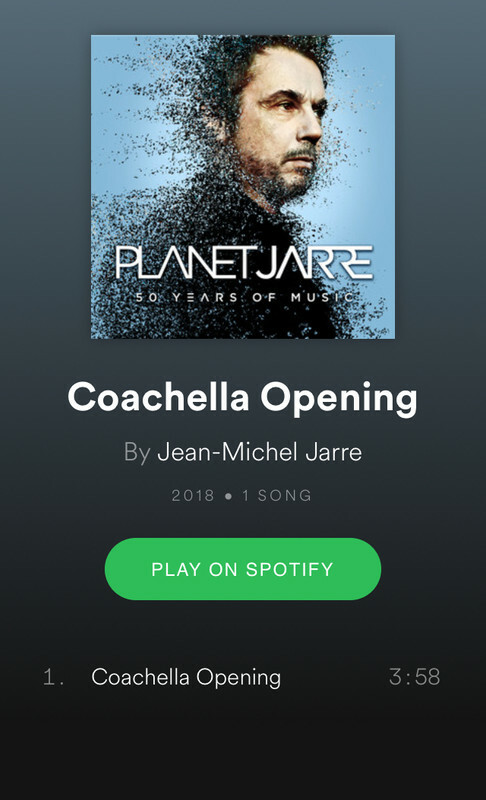 Your reactions to the track were so positive that I have now added it to the PLANET JARRE package. Let me know how you enjoy the studio version. Today the pioneer of electronic music is celebrating his birthday as well as 50 years of his musical career. An event that I will forever connect with the tragic death of my friend Ron McNair, Challenger-Astronaut and Saxofonist with whom I was planning to perform "Rendezvous“. Him up in space, me on stage. Shortly before the concert the challenger exploded and Ron and six other astronauts died. I did not want to play this show, but his friends encouraged me to do so. I’m glad we did it as a way to remember Ron, a great man and friend.